On 10 November (18.00 – 20.00) the Global Governance Institute (GGI), in cooperation with Vesalius College Brussels, the Institute for European Studies and the Belgian Royal Military Academy will organise the next European Peace & Security Studies (EPSS) Lecture. 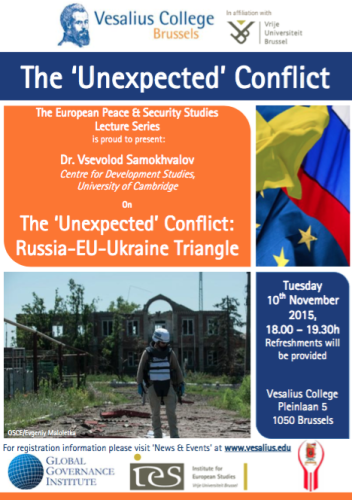 The Lecture will focus on the theme “The ‘Unexpected’ Conflict: Russia-EU-Ukraine Triangle”. Attendance is free, but please register HERE. For further information, please contact akhatcha@globalgovernace.eu. 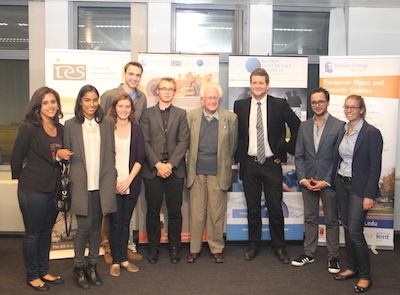 The EPSS Lecture will begin at 18.00 and will be followed by a Q&A session and a light reception. Dr. Vsevolod Samokhvalov, Centre for Development Studies, University of Cambridge. Dr. Vsevolod Samokhvalov, studied international relations in Odessa (Ukraine), Athens (Greece) and Cambridge (UK). He held a number of appointments in European think-tanks and universities in Belgium, France, Greece and Romania. He was also BBC correspondent for Cyprus and Greece, and Eurasian Affairs analyst for New Europe Weekly in Brussels. He currently runs research project on Eurasian regionalism at Cambridge. His forthcoming book is ‘Russia, Europe, Greatness and the Black Sea’.